July 1, 2018 July 1, 2018 J.C. 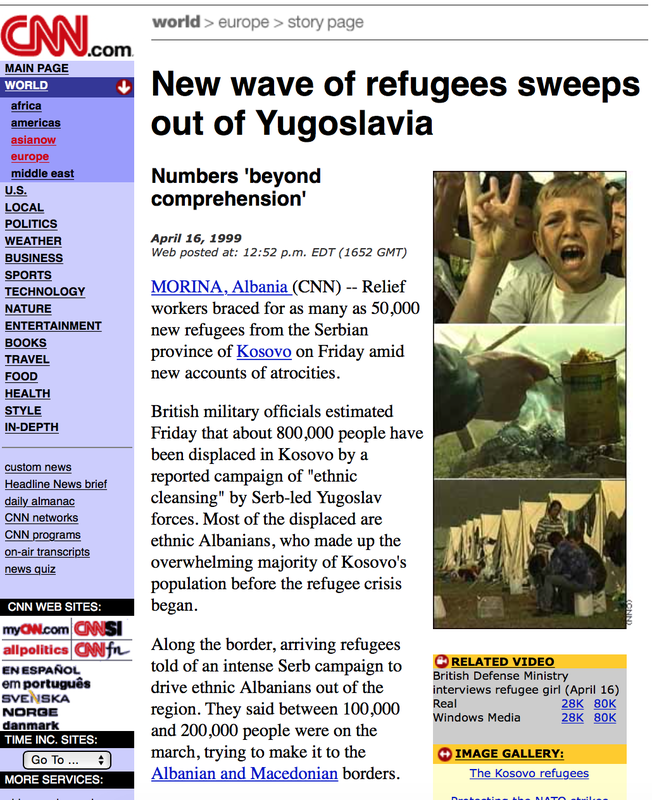 In order to justify aggression on Yugoslavia, NATO, Western allies, public medias, international humanitarian organizations and even Western intellectuals, were fabricating the story that Serbian forces ethnically cleansed more than 800 000 Albanians from Kosovo (they said 90 % of the total Albanian population were forced to leave Kosovo). What really happened is that Albanians were leaving Kosovo via trains towards Macedonia and Albania fleeing from the armed conflict between Yugoslavian military/police against the [US-NATO supported] Kosovo Liberation Army (KLA) [UCK] a terrorist entity with links to Al Qaeda and organized crime. Most of the fights were done in villages with Albanian majority, because terrorists used their homes as military camps and strongholds. Thousands of Serbs and Albanians were used by terrorists as a live shield. None of the Yugoslav authorities ordered the removal of the Albanians nor did the Serbs living in Kosovo. The individual crimes committed by Yugoslav forces were registered and legally processed by military and civilian authorities. In order to frame a process of ethnic cleansing many of the Albanian refugees were leaving their homes during the day, after they have been recorded by CNN/BBC, they would then return to their homes at night. Operation “Horseshoe” coordinated by the CIA was proven to be at The Hague Tribunal as an attempt to blame Serbs for ethnic cleansing. The Yugoslav Army and Police organized public kitchens for all citizens throughout Kosovo and Metohija, and provided regular humanitarian aid to all citizens. 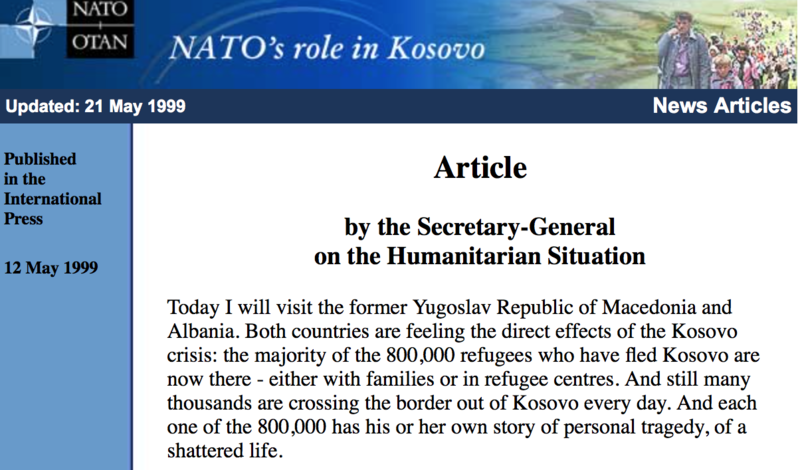 The first massive refugee columns of Albanians started leaving Kosovo after NATO’s aerial attacks, which caused the humanitarian catastrophe. 14 May 1999, village Koriši near Prizren, NATO hit again Albanian refugee column with cluster bombs (thermovisual bombs which reach temperature up to 2000 °C) and killed more than 100 people (NATO and world’s fake news medias accused Serbian forces for these crimes). On 1 May 1999, near the town of Lužane, NATO hit the passenger bus killing 60 people. In the city of Surdulica (my hometown), on 21 April 1999, NATO hit a civilian refugee shelter, where Serbian refugees from Croatia (Republic of Serbian Krajina) were settled, killing 10 people, of which 6 were children and mutilating 16. On 27 April in the same city, NATO hit residential houses in the city center with 10 projectiles, killing 20 people, of which 12 were children, and mutilating more than 100 people. Again in the same city, on 31 May 1999, NATO hit the hospital for respiratory diseases, hospital-gerontological center and refugee shelter, killing over-again 20 Serbian civilian refugees from Krajina and mutilating 88. NATO also targeted Serbian refugees from Krajina in different parts of Serbia. In the city of Surdulica more than 500 residential civilian houses were destroyed during these 3 attacks, including the city waterworks, elementary school and kindergarten. On 30 May 1999 NATO hit the civilian Radio-television tower in the city of Vranje, using depleted uranium ammunition, the amount of measured radiation after the strike was 8 000 times higher than before the strike. World’s average rate of malignant diseases is 2000 per 1 million people, in Serbia (without data from Kosovo) the average is 5500 per 1 million people, which is 2.7 times higher than the world’s average. In Serbia, cancer incidence rate grows 2 % per year, while in the rest of the world the incidence rate grows 0.6% per year. Death rate from leukemia has increased by 139% since 1999. Environmental and biodiversity damage is irreversible. Carried out more than 2 300 arial strikes by NATO airplanes on the territory of Yugoslavia. More than 31 000 projectiles with depleted uranium used (according to NATO sources), the presence of the plutonium is found at targeted locations, which proves that NATO used nuclear waste products for depleted uranium ammunition. 60% of the projectiles with depleted uranium were used against civilian objects. Around 15 tons of depleted uranium was thrown to Yugoslavia in 112 identified locations: 4 locations in the South East of Serbia, 1 location in Montenegro, the rest of 107 is used in Kosovo (NATO sources). Kosovo was targeted with depleted uranium projectiles on a daily basis. More than 37 000 cluster bombs thrown. 20 tons of Chlorine was released in the atmosphere due to bombardment of the petroleum factory in the city of Pančevo on the 15th of April 1999. 16 500 tons of kerosene was burnt on the territory of Yugoslavia due to bombardment of the petroleum factories. Just in two cities: Pančevo and Novi Sad, 3 tons of mercury released into Danube due to bombardment of the chemical and petroleum factories. In the city of Barič, 165 tons of hydrochloric acid released into Sava river. Huge amount of the methylated mercury and heavy metals released in Sava and Danube rivers due to bombardment of the chemical and petroleum factories. 3.5 billion kilograms of soil relocated due to pollution of the soil. NATO aggression on Yugoslavia in 1999, is known in the West only as aerial campaign, but this war was conducted along with joint land-based invasion against Yugoslavia from Albania and FYR Macedonia (operation Arrow). During the war, Yugoslavian Army was successfully defending its territory against joint land and air invasion on state border between Yugoslavia and Albania and Macedonia. NATO forces (consisted of 12 000 soldiers in northern Albania and 17 000 forces in northern Macedonia), included: CIA and US military personnel; British SAS; Norwegian commandos (Hærens Jegerkommando) and Norwegian special units (Forsvarets Spesialkommando); Kosovo Liberation Army (which included the Atlantic Brigade of mercenaries, consisting of US born Albanians), Al Qaeda fighters and other mercenaries, total strength of 25 000 soldiers); Army of the Republic of Albania (2nd Infantry Division of the Army of the Republic of Albania, strengths of about 5,000 people, as well as independent artillery regiments with command in the city of Kukes,). Army of the Republic of Albania used armored units. NATO used all available land and air artillery capacities, including strategic bombers B-1, B-52, airplanes F-16, A-10, and Apache helicopters, launching more than 40 000 projectiles and over 1000 cruise missiles. Despite enormous efforts and devastation, NATO and its allies couldn’t penetrate into Yugoslavian territory as planned, therefore Nobel Prize winner Martti Ahtisaari, threatened to flatten Belgrade and major Serbian cities and infrastructure objects by using strategic bombers all across Serbia. This threat made Serbian political leadership to sign Military Technical Agreement in Kumanovo on the 10th of June, 1999. Radovan Spasic is a political scientist from Serbia. Next MEXICO Elections, July 1: Andres Manuel Lopez Obrador (AMLO), Window of Opportunity Against 40 Years of Neoliberalism in Mexico?